Most people don’t care much about such equipment. However, it has a significant role to play if you spend plenty of time on the road. The use of a best weight distribution hitch (WDH) ensures that your towing vehicle experiences a smooth and balanced ride on the road. To achieve, you must tow according to the weight capacity of the hitch otherwise your towing vehicle will become very difficult to handle and will frequently sag. In this article, we will provide you with various details on what is the purpose of the hitch and its types. We will also review some of the best hitches that you can find on the market. Later on, we will also share some details associated with various attributes that you need to consider before buying the best weight distribution hitch for your vehicle. Do weight distribution hitches help with sway? Do I even need a weight distribution hitch? How we have chosen our top 7 weight distribution hitches? The big question that comes to mind is who do weight distribution hitches work? First of all, we need to understand what sway control is. Your trailer will sway when it is more than the 50% weight of your driving vehicle’s weight. If too much weight is in the back or there is too much wind or there is improper tension in the spring bar then the trailer will begin to sway. For reducing this, you need the anti-sway hitch. These hitches will reduce the sway effectively and will keep your towing trailer in control regardless of the wind or road conditions. Sway control systems are integral parts of WDHs. These devices have two types including the device that reduces sway and its counterpart that eliminates sway altogether. The sway reducing device relies on friction to prevent your trailer from shifting and it will only begin to work once swaying begins. The sway eliminating device applies tension on your towing trailer to make it move in straight line. You would enjoy the benefits of a WDH if the weight of your towing trailer is more than 50% of your driving vehicle. If the rear end of your towing vehicle sags then you will also need this hitch system. If you are experiencing sway on the road then you will also need a hitch to get rid of it. The hitch will also solve any problems associated with the case where you experience troubles in steering or stopping your rig. Now the next question is does weight distribution hitch reduces tongue weight? Yes, it does and it does so by distributing the tongue weight of your trailer towards the front axle of your tow vehicle. It will keep your trailer in a balance. Furthermore, you will also be able to tow more than the capacity of your vehicle. If you want the best then go for Hensley hitch. For those of you who are thinking what is Hensley hitch; it is the only hitch on the market that is guaranteed to eliminate sway with zero tolerance. Trunnion spring bars are linked with the ball mount in the center and are the best option for increasing the rating of load weight. These bars are excellent to use in windy weathers or uneven terrains. On the other hand, round spring bars are linked with the ball mount at the bottom. These bars stay in position with the help of a few clips. With the round bar, you get more clearance to link your trailer with the towing vehicle. It is an excellent option in case if your trailer weighs more than your towing vehicle. Both of these types have their advantages. You need to make sure that which types of WDH you should opt for before going on your trip. 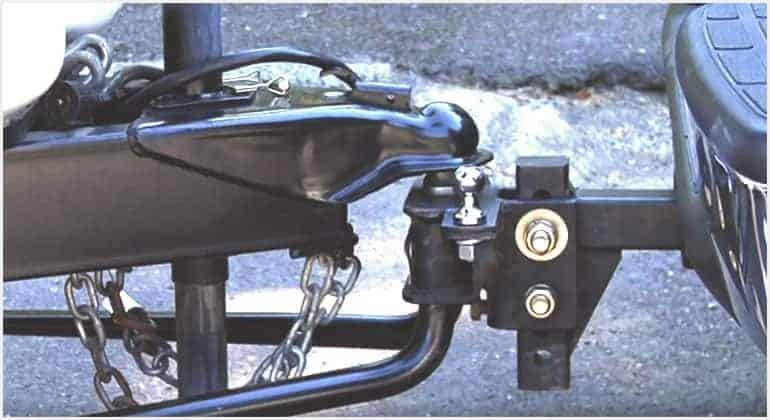 We have gone through numerous customer reviews and product reviews on this topic to develop our list of best weight distribution hitch with sway control reviews. The criteria were simple; we made sure that all the entries feature sway control because it is an integral part of a weight distribution system. Furthermore, we considered those products that were highly regarded by the customers for their performance and durability. We conducted a research of more than 60 hours and went through more than 1000 customer reviews to develop our list of top 7 products. Most of these hitches are extremely popular among the customers but each of them comes with their own unique characteristics. Blue Ox manufactured the BXW1500 as a weight distribution hitch is responsible to give a balanced and smooth ride and let you tow the greatest capacity. The Blue Ox constructed it by a powered coating of steel and comprises with 2-inch shank, present 8-inch rise, and a 2-inch drop. The company provides a good sway system, which helps to prevent sway and balancing trailer’s load. There is no need for drilling; it comes with a clamp-on bracket. The hitches create an even traveling, provide proper stability, and control both trailer and vehicle. This flex can work as interchangeable, which means that this spring bar also works with other spring bars and lift the weight capacity. It helps to control the rides for even weight distribution due to automatic lock in place and can be easily removed. Sometimes trailers sway by a crosswind, improper spring bar, and bad trailer loading. The built-in sway control system helps to provide a weight distribution evenly that prevents the rides from sway. In addition, a lift bracket is rotating to ensure the chains are rigid and protect the spring bars from moving side to side. A system that functions to self-lock the device and there is no need for any clip or pins. The maintenance and assembly of this hitch are quite simple and easy to clean through built-in two grease zerks. The design of this weight distributor clamps on with an adjustable shank. Blue Ox weight distributor hitch can handle tongue weigh about 1000 lbs to 1500 lbs and the lift-bracket position should be mounting regarding 29-inch back as of hitch ball. The overall length of the shank that is a hole for using hitch ball is 3-inch. This product of Blue Ox is highly compatible with both types of break, electric and surge. The E2 hitch is popular due to 2-points, steel-on-steel friction which works as prevention and trailer sway helps to give correct and even distribution of weight. The adequate sway control bracket aid to stay the trailer in line along with the tow vehicle. It is also equipped with an adjustable shank. This round hitch comes with a unique design that is compatible with electric and surge-break actuators. There is an integrated sway control which works as 2-point that limits the movements as side-to-side. The brackets are very helpful to keep the trailer in line by keeping the spring bars in proper place for a strict system. The steel-on-steel friction aids to reduce the sway because of sudden winds and plans. There is no need to lift the chain that helps to remove unwanted movement. This round hitch provides the stability and proper leveling control to the vehicle and trailer by using the Trunnion spring bar flex. There is no drill required but just adjustable brackets adjusted at the frame of the trailer for maintaining even weight distribution. The hitch is constructed by a power layer of steel that is highly durable as well as resistant to corrosion. This feature makes it unique and more comfortable to use because snap-up lever helps to configure it easily and quickly by minimizing the lifting required by a jack for the trailer. The E2hitch is made of durable quality and is extremely good along with its features. The supportive trailer weight 10000 lbs as well as tongue weight range is 1000 lbs. The hitch involves multiple weight distribution system such as WD head, double bracket for sway control, two spring bar flexes, snap-up lever, washer with spacer rivet, and other important installation hardware tools. The Husky is responsible to provide you those pioneer towing products that are prepared under the new technology for satisfying the highest level of customers. It is compatible with 12000 lbs gross trailer weight and 800 to 1200 lbs Tongue weight. The Husky brings this center line TS with spring bars, improved design, using innovative technology and high-quality material in the direction of producing extremely good and improved the towing experience. Its lighter and spring balls work together for delivering quick, smooth, and more approachable ride. The Trunnion manner spring bars are together for balancing the weight distribution, sway control system, advanced performance, supreme values, and more clearance product. This smoothness presets high responsive ride, which is a noticeable feel in the market as compared to other products. This product of Husky comes with sway control where no additional hardware is required because the built-in hardware’s are enough to show the high performance with its value. The hitch ball is pre-installed perfectly, the handles are used to hook up, and the EZ universal adjustable frame brackets are easy to configure and adjust. The Husky delivers a better-quality product in a superior way so that you utilize this lightweight, compact design hitch in your riding. The eye-catching feature is the use of superior innovative technologies and mechanisms in its manufacturing. The Equal-i-zer is one of the best sway control hitches that make your journey safer. If you are making any maneuver, the Equal-i-zer hitch keeps your trailer with you. The 4-point sway control, multiple trailer compatibility, quality construction, and weight distribution make it more eye-catchy product. The company provides you 4-point sway control that is most calming and highly advanced technology for towing and gives you a safe journey. The Equal-i-zer hitch is popular due to the use of a 4-point sway control system with superior performance and greater value. The WD hitch Equal-i-zer is highly compatible with multiple trailers like cargo, utility trailer, RV, boat, and horse as well as those trailers that comprise with surge brakes can use it easily and quickly. It is easy to set the appropriate other adjustments and very convenient to adjust the angle while hitching and unhitching. This is an American product made using the superior quality steel in its construction. Due to a high-quality product, a lifetime warranty is offered. The compact design of this hitch transfers the tongue weight evenly, stopping vehicles, improving steering, and give a smooth, pleasant, balancing and enjoyable journey. The innovative sway hitch is built in the USA by using high-quality steel for their customer’s safety. It is highly equipped with hardware that produces high performance with the greatest value and there is no need to add additional hardware. The spring bars, snap-up lever, sway control brackets, WD shank; WD head makes it more popular and well suitable for all types of trailers. The company EAZ LIFT equipped Camco Elite hitch with an adjustable ball mount and a shank that allows trailers to enjoy a smoother ride. The maximum tongue weight is 1000 lbs. and the gross trailer weight is 10000 lbs. Camco EAZ LIFT hitches are engineered with high-quality steel processed with innovative technologies. By using this, you can enjoy the comfort of towing in your journey. The hitch-ball is pre-installed in it. The WD hitches come with a complete tool which includes spring bars, chains, hitch-ball, shank, clips, ball mount, and bolt package to adjust the hitches angles. This superior sway control system did not create any noise. You can easily move the steering while using this hitch. The manufacturer offers you to enjoy 5-year warranty along with plenty of hardware that enhances the performance of the hitch. It can be operated with a latching action. You can also adjust the clips and bolts according to your trailer because those are adjustable. EAZ LIFT produces the high-quality hitch that fully satisfies the customers at an affordable price. The sway system allows you to move your trailer side to side with improving the steering. This product will help you to enjoy your ride with your friends or family. The Andersen weight distribution hitch is the best option for you if you are looking a hitch without sway and greaseless system. It is made by high-quality material and used them to add new advancement and technology that make is simplest, and innovative. The Anderson hitches are available in 4-inches to 8-inches drop that did not raise the bar more. It creates a new level record that gives the popularity of this product in the market as compared to other. This product comes with anti-sway that helps to reduce the role of vehicles during the irregularities over the road. This product is constructed with superior materials where the bolts and shanks did not need any kind of grease. They work properly and smoothly without grease. This grease-free system also allows the coupler and balls to move as one. It is easy to setup. The best feature of this WD hitch is that it offers motion-dampening system. This system helps to decrease the bounces of vehicles and provide you a safer and smooth ride as well. By removing the one pin, it unhitches from your tow vehicle. The best anti-sway and anti-bounce hitch have 10000 gross vehicle weight rating and maximum 1000 lbs tongue weight at 2-inch ball. Plenty of superior materials give you a quiet and calm ride. Through modern and innovative technology, there is no need to backing up like other products. If you want to buy a decent quality hitch and don’t want to pay much for it either then don’t look any further. The 49903 weight distribution hitch is your perfect choice as it comes with a heavy-duty sway control mechanism. Furthermore, this kit will provide you with everything that you need for safe towing and high performance. The sway control of this distribution hitch is preinstalled. This means that you don’t have to spend hours in balancing out your hitch according to your to your tow vehicle. The balls for the hitch and the sway control are pre-torqued and ready to use with the chains and the u-bolts. Your purchase will include all the tools and hardware that you will require to install this kit onto your towing vehicle. You will find the mounting hardware as well as the sway control for friction in the package. It means that you won’t have to buy any third party equipment for installation. Pro Series is so confident about this hitch that they provide the customers with a limited 10-year warranty. Additionally, the welded bar of the hitch and its fabricated head ensures long-lasting performance. You will feel the difference once you install it. This kit will provide you with a combination of performance and safety as well as improved towing. The hitch comes with a limited warranty of 10 years. The balls for sway control and hitch come pre-torqued and installed. Its hitch bar is welded and is equipped with a fabricated head for lasting performance. Your purchase will include all mounting hardware and you won’t have to purchase any third party equipment for installation. The length of the hitch bar is a bit too short and the kit will keep the trailer close to the towing vehicle. The 49903 kit from Pro Series provides you with a perfect balance between features and price. It will not break your wallet but will deliver exceptional performance for a good period of time. However, it is best suited for the towing vehicles that have enough room at the back to the house a kit with small hitch bar. Now there are a huge variety of WDHs available on the market. Each manufacturer has introduced its own unique design. Therefore, choosing the right type of hitch for your trailer can become an eschewing task. Therefore, we have developed this buying guide for your assistance so that you might look for certain traits before you finalize your purchase. Make sure what your needs and requirements are and choose a product accordingly otherwise you will end up overspending and will have to buy another product later on. ♦ How Does Weight Distribution Work? A system of weight distribution assists in providing a smooth and balanced ride and helps in correcting the sagging of tow vehicle along with improving the stopping steering as well as sway control. There are spring bars within the weight distribution systems that eradicate the issues that occur when you use regular hitches. Adding spring bars leverages the towing system and distributes the weight to all the axles of your tow vehicle and trailer. The weight remains even and the ride becomes smooth and adequately balanced. ♦ How much does a WDH weigh? ♦ What is Sway Control? Crosswinds, improper tension on spring bar and inadequate trailer loading cause trailer sway. The use of these hitches can reduce this sway because they balance out the weight distribution. Nevertheless, the problem of crosswinds is still intact and you need some further enhancements. To tackle the winds, a small sway control device also comes in these hitches there are two different types of such devices. One of these devices looks to control and reduce sway while the other prevents it altogether. A WDH might come with an inbuilt sway control device or you it might not. If you find a hitch that doesn’t come with such an inbuilt device then you will get the option of adding on the sway control device. Add-on and inbuilt control don’t seem to differ but they do. There is no doubt that inbuilt sway control works very well and is highly effective. A hitch within inbuilt sway control utilizes the friction between brackets and spring arms. These arms are pressed down on the brackets during weight distribution to the axle on the front. The side movement produces even more friction between the brackets and arms and the overall sway stays in control. But does add-on work the same way? In the add-on device, you have to add the arm by yourself later on. This arm attaches to the one side of the hitch in-between the hitch head and the trailer frame. You can make adjustments to the levels of friction by pressing down the handle. Add-ons don’t work well because you must remove them in case of backing up or turning tightly. Furthermore, you don’t need an add-on in slippery road conditions either for instance, rain, gravel, sand, snow, ice etc. The quality of the spring bars has a significant role to play in the efficacy of the weight distribution system. Before choosing the right quality of the spring bars you must make sure to determine the correct tongue weight. The tongue includes everything that you have at the back of your towing vehicle including any backpacks places at the back of the trunk of your towing vehicle. You should pick the right quality of springs according to the tongue weight and your weight distribution system will work at its best. The hitches come with two different kinds of ratings including the rating for the maximum trailer weight that they can handle and the rating for the tongue weight they can bear. Both these ratings should be above the weight of your trailer. However, make sure that the margin between the two is not overwhelming. These ratings are not applicable to an Andersen weight distribution hitch because this hitch doesn’t come with spring bars. The weight rating of this hitch relies on the capability of hitch ball and size of the receiver hitch to fit multiple trailer weights. In most of the cases, a 100-pound WDH can conveniently handle a trailer that weighs between 4,500 and 10,000 pounds. It is important that if you have loaded something at the back of your towing vehicle then you must also consider that before you finalize your purchase otherwise you will have trouble with the tongue weight of your hitch. There are two different types of accessories that can work well with the WDH and enhance their performance. There is a pole-tongue adapter that is designed for use on the trailer that doesn’t come with an A-Frame tongue. This adapter clamps around your trailer’s tongue and serves to be the attachment points for your weight distribution systems lift brackets. In addition to that, you can also buy a tote bag for your hitch when you are not using it for towing purposes. You can disconnect your hitch when not using it and place it in your tote bag for safe storage. There are different models of WDHs available on the market, they all have their own designs and some of them are very popular among the users. All these designs come at varying prices. However, the hitches that offer exceptional quality also come at high prices. If you think that you travel a lot and take plenty of stuff in your trailer or you have to go through tough road or weather conditions then make sure to invest in the good quality hitch to avoid any trouble on the way. Low-quality hitches will only last for a few months and will also cause plenty of trouble during various applications. Therefore, it is important that you go through different reviews and brand ratings before you finalize your purchase. You must also go through different ratings and specifications of the hitch you are considering. WDH have plenty of significance when it comes to smooth your ride and enabling you to tow beyond your vehicle’s capabilities. The hitches from Blue Ox, Fastway and Husky are one of the top competitors when it comes to hitches. These hitches are rated very highly by the customers and are excellent to use in various weather and road conditions. These products come with sway control and keep your ride balanced throughout your journey. It is important that you must understand what you need from your hitch. Only purchase the products that meet all your needs and preferences or you will make a wrong investment. Go through the weight capacity and tongue capacity ratings of the hitch that you are considering and then match it with your towing vehicle and trailer. Always look for sway control that is built-in and never go for an add-on if you prefer convenience. We hope you found this article interesting and informative. We have gone through numerous customer reviews and product descriptions to compile our list of best weight distribution hitches for you. If you have any questions or suggestions, you can reach out to us by dropping your comment in the sections provided below.